Though Sir Arthur Conan Doyle is best known for his detective stories, he also wrote other short stories which are masterpieces of mystery and suspense. In some of the stories in “Tales of Terror and Mystery”, a suppressed uneasiness gradually builds up and evolves into sheer terror. In others, the story line unexpectedly changes and comes to a horrific conclusion. Sit back in the comfort of your armchair and let yourself be transported to the strange but compelling world created by Sir Arthur Conan Doyle. . . .They swung along, with the huge tombs looming up through the darkness upon each side of them, until they had come as far as the Catacombs of St. Calistus, and saw against a rising moon the great circular bastion of Cecilia Metella in front of them. Then Burger stopped with his hand to his side. "Your legs are longer than mine, and you are more accustomed to walking," said he, laughing. "I think that the place where we turn off is somewhere here. Yes, this is it, round the corner of the trattoria. Now, it is a very narrow path, so perhaps I had better go in front and you can follow." The descriptions of aeronautics in The Terror of the Skies dragged on a little too long for comfort and another tale used the most trite of twists, but otherwise, good God, Doyle is a great writer. There's too much to summarise here, each tale widely different yet all sinister and compelling. This is the collection of stories that had convinced me about the incredible storytelling ability of Sir Arthur Conan Doyle. People tend to remember him only as the creator of Sherlock Holmes. But these stories are miniature classics in building of suspense, mystery and horror. Arthur Conan Doyle published these short stories later in his career. Half are tales of terror, and the other half are mysteries. It seems that Doyle is much more comfortable with the mysteries, particularly the two relating to railroads: "The Lost Special" and "The Man with the Watches." A mixed bag. Most are quite good, a few are even fabulous, but the first two—“The Horror of the Heights” and “The Leather Funnel”—are among the worst, showing the unscientific mind of Conan Doyle and his propensity towards the fantastic and the spiritualism. I seem to find myself on a bit of a Sir Arthur Conan Doyle kick lately. I've been throughly enjoying his work but wanted to take a short break from Sherlock Holmes. What is an avid reader to do? 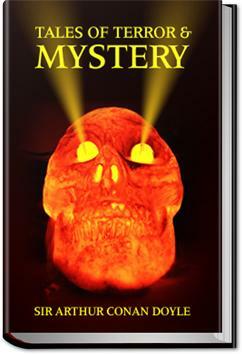 Why, pick up "Tales of Terror and Mystery", of course!